But even with this shared tone of openness to learning from others, I would like to supplement, and constructively critique, her reflection. I was a former worship leader and active member at Willow and am now among the papist enclave. I have maintained warm friendships at Willow, one with a worship leader there, Aaron Niequist. When my friends and I co-authored an ecumenical prayer book, we visited and spoke at Willow’s weekend services. Aaron incorporated some of the book’s songs into the worship. Aaron has even been writing his own albums titled “A New Liturgy,” where he is intentionally trying to make evangelical worship more “liturgical,” and introduce it to Willow—with mixed results. 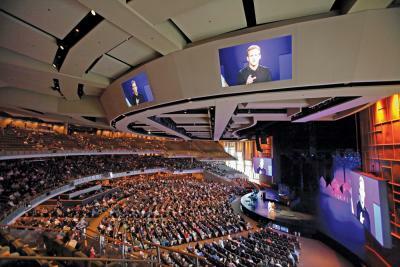 I start by noting what Ziliak observed at length: Willow Creek’s use of live-feed images of worship leaders on enormous screens. When I attended a Willow-branded congregation in Denver this Christmas, I must state that I had to look down much of time; I was being shown close-ups of expression-loaded faced, eyes squinted and hands raised in pious communication with the deity. Seeing myself from years ago in the faces of these people, I recalled how such expressions, while in part sincere, are also part of a feedback loop of imitation. “Heart-felt expression” is the ritual here; and others are supposed to catch on to it, even if it is not “required” in the obligatory Catholic, liturgical sense. We are, as Rene Girard puts it, mimetic creatures, and we imitate the expressions and desires of those around us. I recall as a teenager, even before I joined the worship team, this magnetic pull to join the “spontaneous” worship—to stand with the wave of people standing up. What if one kneels down and prays not so much to regain one’s own belief but, on the contrary, to get rid of it, to gain a minimal distance from its overproximity, a breathing space? To believe “directly”—without the externalization of a ritual—is a heavy, oppressive, traumatic burden, which, through a ritual, one has a chance of transferring onto an Other (God is In Pain, p. 190). The distance—I might almost say, “insincerity”—of ritual is, obviously, not the only way to worship the Silent Mystery in which we live, move and have our being. And I think it a sin to judge people’s hearts at Willow. But I will argue that “empty ritual” has a special capacity for inviting contemplation of the empty, infinite, abyss of God that the mystics express. It may be the case that “silence is the first language of God”; and thus perhaps neither ritual nor sincerity might gain us access beyond the front ranks of the angels. But I can say without hesitation that what I once thought was my boisterous sincerity (my “body language indicating I had been clearly moved” in Ziliak’s observation) was in fact my ritual-imitation of my worshipping neighbor. It was also the gesture that I, as a leader, thought I was supposed to project. Nobody escapes cultic ritual, just as nobody escapes culture, just as no one escapes the cycles of imitation. Evangelical worship can sometimes be one long attempt at such an escape. As noted, one of Willow’s worship leaders is already quite uncertain about all of the entertainment, and has thus been experimenting—just a bit—with liturgical forms. He concurs that there is a small but growing dis-ease among evangelicals about their whole rubric of worship; and they are not sure what is next. Indeed, Willow Creek posted a few years ago an extensive study of their congregation, stating that, for all their flare and dazzle, they had grown wide but not deep. (I admire Bill Hybels and all his staff for their humble clarity to reveal such hard lessons learned.) It is with this study that we must qualify Ziliak’s observation that “they are clearly doing something right.” They just did us all a favor and told us that is not necessarily the case: they have learned to draw a crowd (a phenomenon about which the New Testament is skeptical at best), but they are in doubt on how well they’ve drawn up disciples of Jesus. I was once told that, at Vatican II, the Catholic Church became modern just as the modern world was beginning to question modernism. And though there are some techniques to appreciate in Willow (and plenty of friends to love), if the Catholic Church uncritically imitates Willow-worship it may become hyper-modern just as the Willowites start genuinely questioning their hyper-modernism. Chris Haw is a carpenter, author, husband, and father of two. He is the author of the award-winning book From Willow Creek to Sacred Heart and co-author of Jesus for President. He is working on his PhD in theology and peace studies at Notre Dame University.